This article is about the American rock climber. For the musician, see Tommy Caldwell (musician). For the footballer, see Tommy Caldwell (footballer). Tommy Caldwell (born August 11, 1978) is an American rock climber accomplished in sport climbing, hard traditional climbing, big-wall speed climbing, and big-wall free climbing. Caldwell made the first free ascents of a handful of El Capitan routes in Yosemite National Park. He made the first ascents of some of the United States' hardest sport routes including Kryptonite with grade of 5.14c/d and Flex Luthor with a grade of 5.15a, at the Fortress of Solitude, Colorado. In January 2015, Caldwell and Kevin Jorgeson completed the first free climb of the Dawn Wall of El Capitan. The 19-day ascent of the Dawn Wall is considered by some as the hardest successful rock climb in history. In 2015, National Geographic called Caldwell "arguably the best all-around rock climber on the planet." Caldwell grew up in Loveland, Colorado. His father is Mike Caldwell, a former teacher, professional body builder, mountain guide and rock climber, who introduced Tommy to rock climbing at a young age. His mother, Terry, was also a mountain guide. The family, including a sister, went on annual trips to Yosemite National Park where Tommy's love for the park and rock climbing flourished. Caldwell and fellow climbers Beth Rodden, John Dickey and Jason Smith were held hostage for six days by rebels in Kyrgyzstan in August 2000. Caldwell pushed a lone captor, Ravshan Sharipov, off a cliff, and subsequently escaped to government soldiers. They later learned that Sharipov survived the fall. A book about their ordeal, Over the Edge: The True Story of Four American Climbers' Kidnap and Escape in the Mountains of Central Asia was written by Greg Child. A follow-up article, "Back from the Edge", was published in Outside magazine the following year. Caldwell gave a filmed lecture "How Becoming a Hostage and Losing a Finger Made Him a Better Climber". Caldwell accidentally sawed off much of his left index finger with a table saw in 2001. Doctors were able to reattach the severed portion, but Caldwell subsequently had it removed so as not to hinder his climbing career. He made the first ascents (FA) of some of the United States' hardest sport routes (as of 2008) including Kryptonite (5.14c/d) and Flex Luthor (5.15a) at the Fortress of Solitude, Colorado. In May, 2004 he completed the first free ascent of Dihedral Wall. In 2005, he and Beth Rodden—swapping leads—made the third and fourth free ascents of The Nose. Two days later, on October 16, Caldwell free-climbed The Nose in less than 12 hours. A few days later, Caldwell climbed The Nose in 11 hours, descended the East Ledges, and then climbed Freerider, topping out 12 hours later – the first ascent of two El Capitan free climbs in 24 hours. 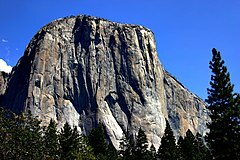 On El Capitan, Caldwell has also free-climbed: Lurking Fear, Muir Wall, West Buttress, Salathé, Zodiac and Magic Mushroom. In January 2015, Caldwell and Kevin Jorgeson completed the first free climb of the Dawn Wall of El Capitan in Yosemite National Park. The Dawn Wall, a documentary following Caldwell and Jorgeson on their free climb of the Dawn Wall, was released on September 19, 2018. The documentary was directed by Josh Lowell and Peter Mortimer. Caldwell appeared in the documentary Free Solo, released in September 28, 2018, about Alex Honnold's free solo ascent up El Capitan in Yosemite National Park. In the documentary, Caldwell is seen working with Honnold to prepare for the climb, and is interviewed about Honnold and rock climbing. 2001: The Honeymoon is Over V 5.13 Longs Peak, Colorado, USA. FA with Beth Rodden belaying. 2006: Linea di Eleganza VI 5.11b A3 90 degrees M7 Fitz Roy, Argentine Patagonia. FFA with Topher Donahue and Erik Roed. Caldwell and Beth Rodden married in 2003, and subsequently divorced in 2010. In 2010 he met photographer Rebecca Pietsch, they married in 2012. The couple have a son, Fitz, and a daughter, Ingrid Wilde, and live in Estes Park, Colorado . The push: a climber's journey of endurance, risk and going beyond limits. London: Michael Joseph. ISBN 9780718183394. ^ a b Carpenter, Hayden (2018-09-18). "'The Dawn Wall' Is a Great, But Incomplete, Climbing Film". Outside Online. Retrieved 2019-03-15. ^ a b c d Allen, Nick (January 11, 2015). "World's best climber only has nine fingers - the life and times of Tommy Caldwell". ISSN 0307-1235. Retrieved 2019-03-15. ^ Achey, Jeff. "Legends: Tommy Caldwell". Climbing Magazine. Retrieved 2019-03-15. ^ Estabrook, Rachel. "New Memoir Describes How Tommy Caldwell Was Raised To Climb The Dawn Wall". Colorado Public Radio. Retrieved 2019-03-15. ^ "Father's Day with Some of our Favourite Climbing Dads". Gripped Magazine. 2016-06-19. Retrieved 2019-03-15. ^ "Mountaineering - Back from the Edge - Mountaineering - OutsideOnline.com". Outside Online. ^ "Climbers Recount Kidnapping in Kyrgyzstan". National Geographic. May 28, 2003. Retrieved July 31, 2012. ^ Child, Greg (March 17, 2015). "When Rock Climbing and Terrorism Collide". Outside. Retrieved February 8, 2018. ^ "How Becoming a Hostage and Losing a Finger Made Him a Better Climber". video.nationalgeographic.com. Retrieved 2018-07-25. ^ "Tommy Caldwell Loses Finger". Camp4. October 5, 2006. Retrieved July 31, 2012. ^ Gartland, Dan (January 14, 2014). "Climbers complete free-climb ascent of El Capitan's 'Dawn Wall'". Sports Illustrated. Retrieved January 15, 2014. ^ Bisharat, Andrew. "Duo Completes First Free Climb of Yosemite's Dawn Wall, Making History". National Geographic. Retrieved January 15, 2014. ^ Caldwell, Tommy; Roger Briggs (March 2007). "The Honeymoon is Over". Alpinist. Jackson, WY, USA: Alpinist Magazine. 19 (Spring 2007): 40. ISSN 1540-725X. ^ "2003 Golden Piton Awards – Sport Climbing". Climbing Magazine. Action Sports Group. Retrieved March 2, 2007. ^ Wright, Cedar (2004). "YOSEMITE VALLEY – Various Activity". Alpinist Magazine. Marc Ewing. Retrieved March 2, 2007. ^ MacDonald, Dougald. "Caldwell Frees Dihedral Wall". Climbing Magazine. Action Sports Group. Retrieved March 2, 2007. ^ MacDonald, Dougald. "Caldwell-Rodden Free the Nose". Climbing Magazine. Action Sports Group. Archived from the original on November 3, 2006. Retrieved March 2, 2007. ^ Caldwell, Tommy; Topher Donahue (September 2006). "Scattered Ashes". Alpinist. Jackson, WY, USA: Alpinist Magazine. 17 (Autumn 2006): 50–57. ISSN 1540-725X. ^ Beckwith, Christian (May 20, 2008). "More Details on Magic Mushroom". Alpinist Magazine. Marc Ewing. Retrieved August 18, 2008. ^ "Caldwell, Honnold: Yosemite Free Triple Crown". Climbing.com. Retrieved July 31, 2012. ^ "Caldwell, Honnold Complete Fitz Traverse". Climbing.com. Retrieved September 23, 2015. ^ Chris Van Leuven. "Free at Last: Caldwell, Jorgeson Top Out the Dawn Wall". Alpinist.com. Retrieved January 15, 2015. ^ "Alex Honnold and Tommy Caldwell climb The Nose in under 2 hours to set new El Capitan speed record". PlanetMountain.com. Retrieved 2018-08-12. ^ Cordes, Kelly (September 10, 2010). "Granite China". The Cleanest Line. Retrieved July 31, 2012. ^ Andrew Bisharat. "Summiting Yosemite's Dawn Wall, Climbers Make History". National Geographic. ^ "Abduction. Lost Finger. Now, a Rock Climber's Tallest Hurdle". The New York Times. August 1, 2015. ^ Kurutz, Steven (2018-12-28). "A Tour of Rock Climber Tommy Caldwell's Garage". The New York Times. ISSN 0362-4331. Retrieved 2019-03-15. This page was last edited on 22 April 2019, at 22:50 (UTC).